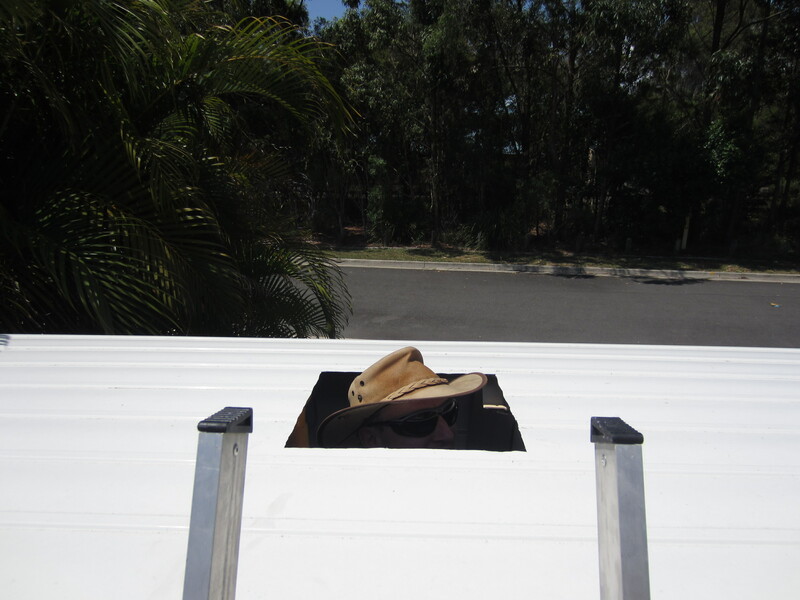 Me: Please can we have a pop-up roof? It would have been a huge and expensive job to raise the roof, and seeing as we’re never going to spend a lot of time meandering from one end to the other, it’s been the right decision. Yesterday though, we did enjoy a brief taste of vertical freedom, and were momentarily permitted to uncurl ourselves out of a nicely perfected stoop and stretch out to full height. Admittedly it was a bit restrictive, and we couldn’t move our head for fear of being garotted but it was exciting nonetheless. 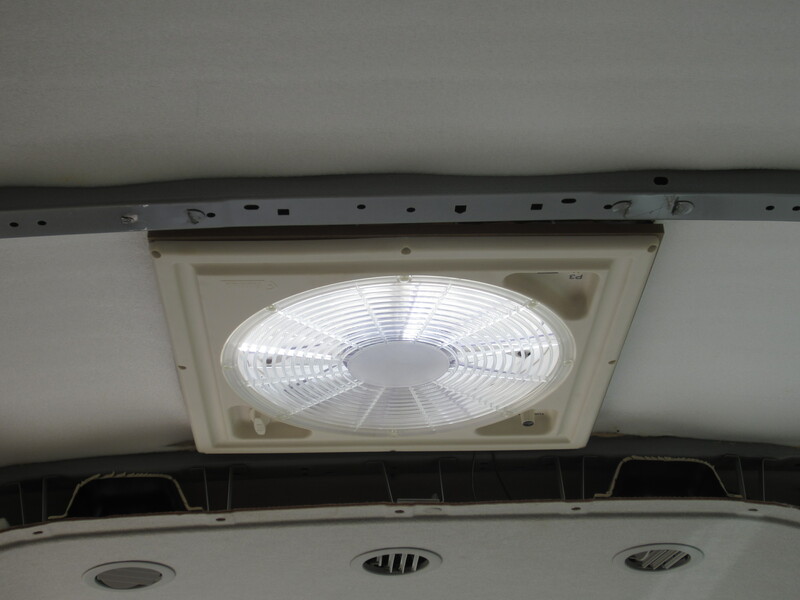 The hole is for our ceiling ventilation fan, which will provide a welcome through-draft during the summer months. 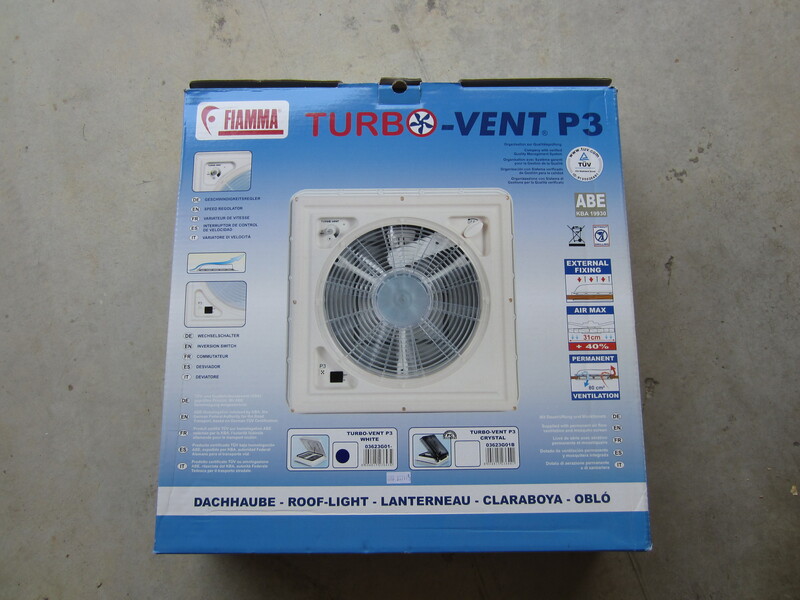 Our fan is a Fiamma Turbo Vent P3. 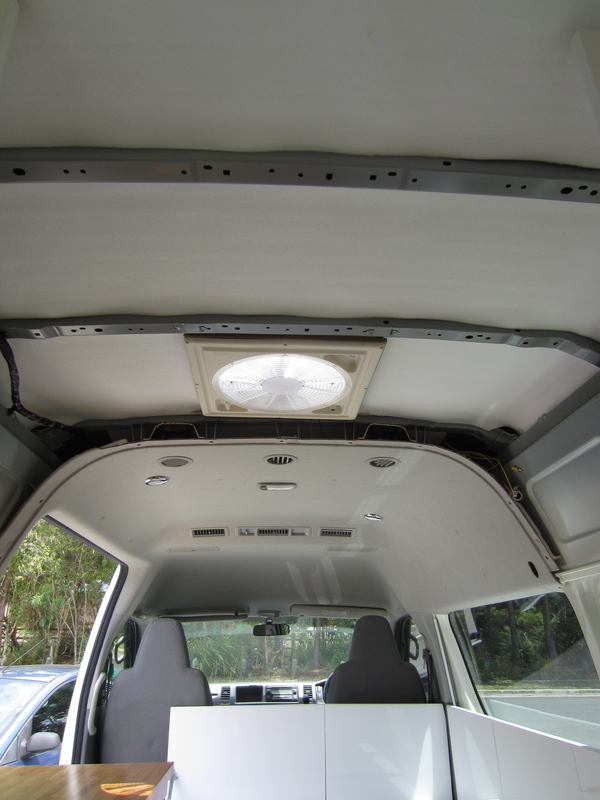 Measure out a cardboard template to make absolutely sure the hole you’re about to cut in the roof of your van is the right size. Using tin snips, cut out the rest of the hole according to the template. Position the fan in place on top of the roof. 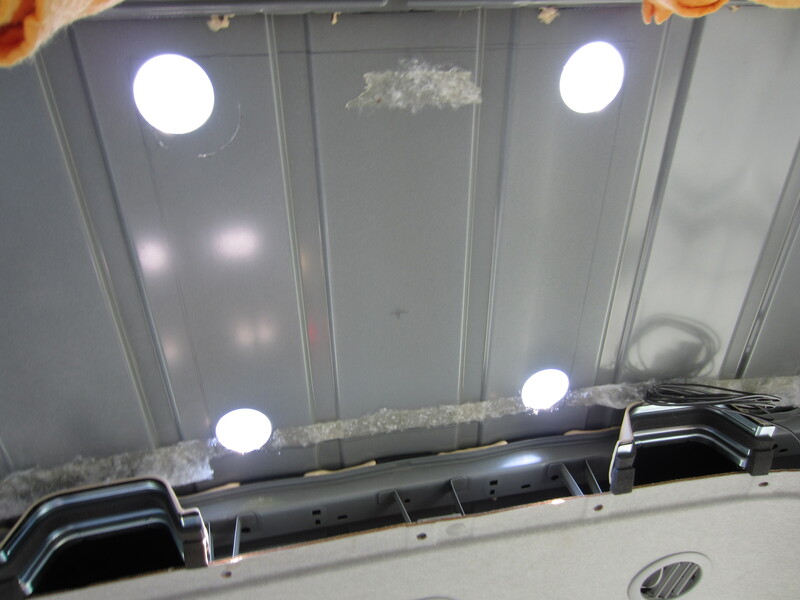 Drill 20 holes, 5 down each side, through the frame of the fan into the roof. Remove the fan. 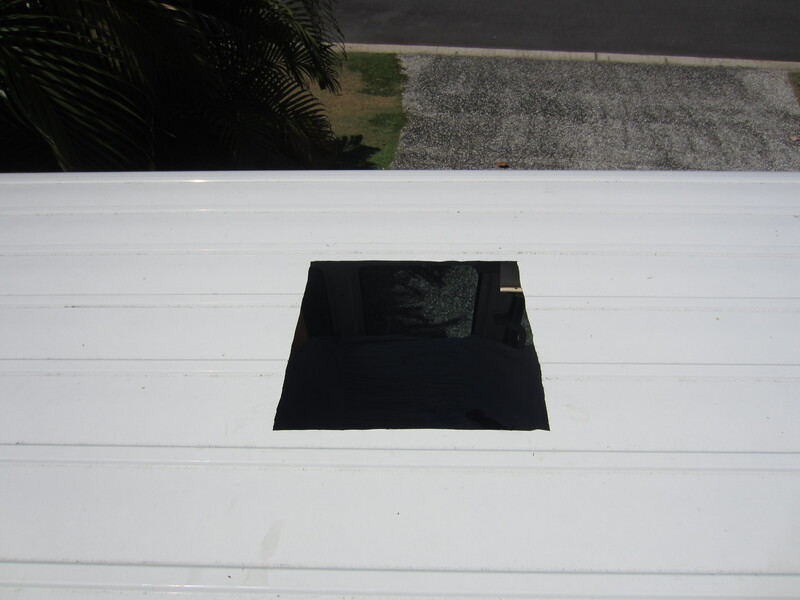 Rust proof all the cut edges and exposed metal around the hole with a heavy duty primer. 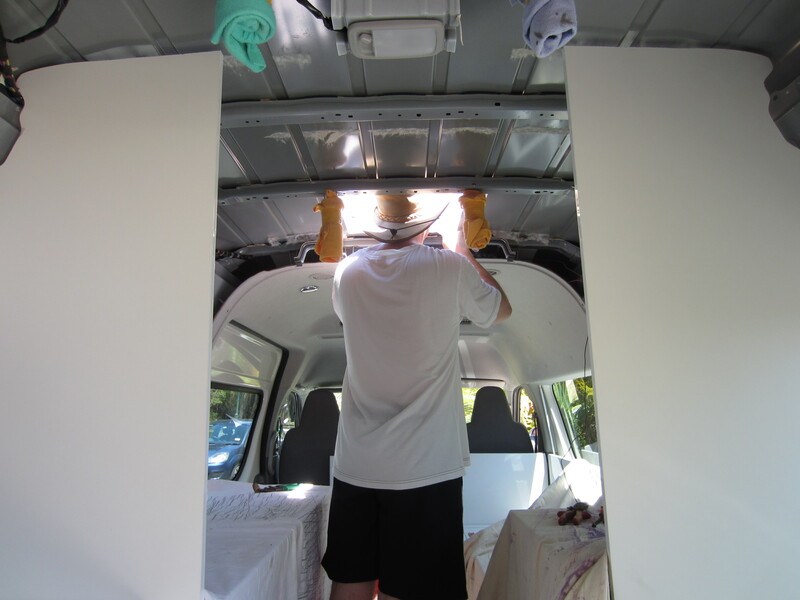 Squeeze plenty of silicon around the edge of the frame and around the hole itself – we hopefully used enough to withstand a Queensland summer storm. 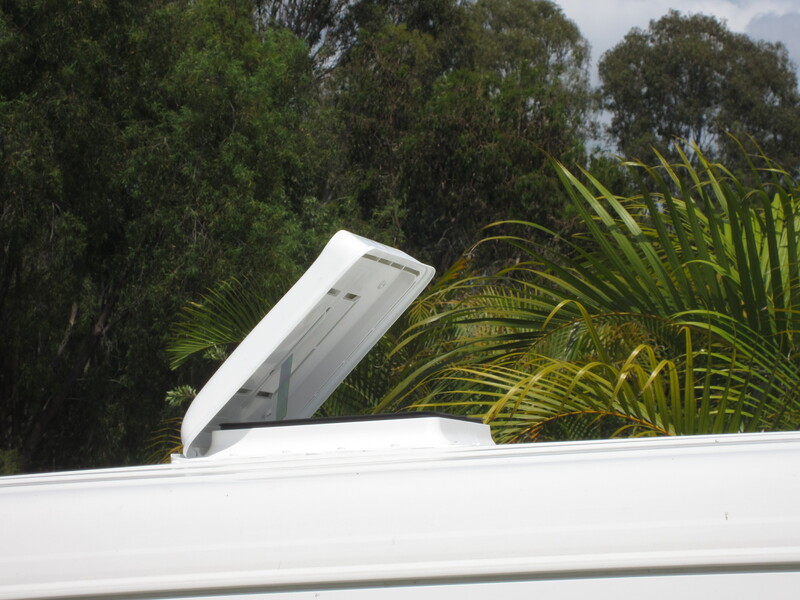 Place the fan in position on the roof with the hinge at the front (to stop it flying off when you’re whizzing along) and use stainless steel bolts to fix it in place. 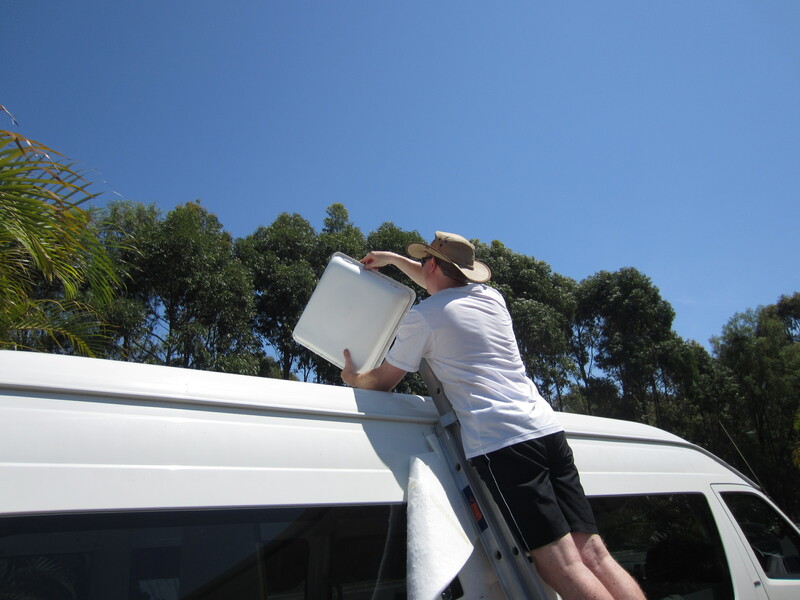 At this stage Paul was on top of the roof screwing the bolts down while I was inside holding them from underneath, and trying to dodge the long drips of silicon that squirted through every time he put a screw in. (I can attest to its waterproof qualities though, it is still adorning my hair three showers later). 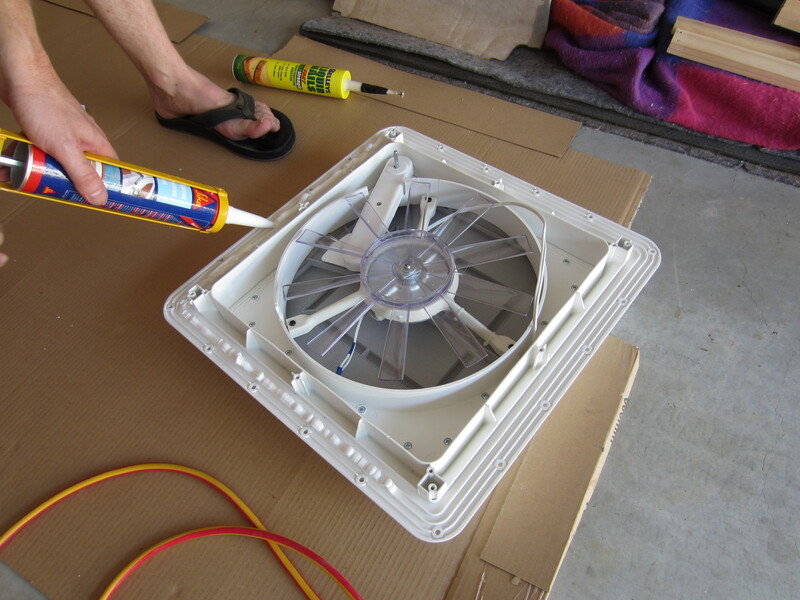 Wire the fan into the 12v circuit via the master switch. You turn the handle to open up the roof, then switch it on. 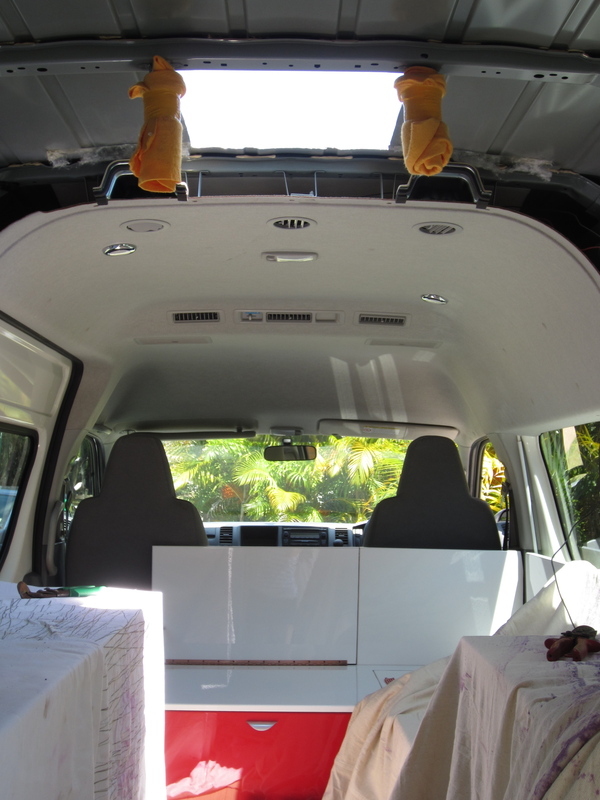 Ours provides an amazing breeze and should cool the campervan down pretty quickly. It does sound like we’re about to take off if we turn it up very high, so it’ll be interesting to see if we can use it at night. As the pictures above show, Paul has now also insulated the ceiling using the remainder of the flooring insulation, so thankfully our hair no longer starts to sizzle when we bump into the metal ceiling. Next stage is the lighting! 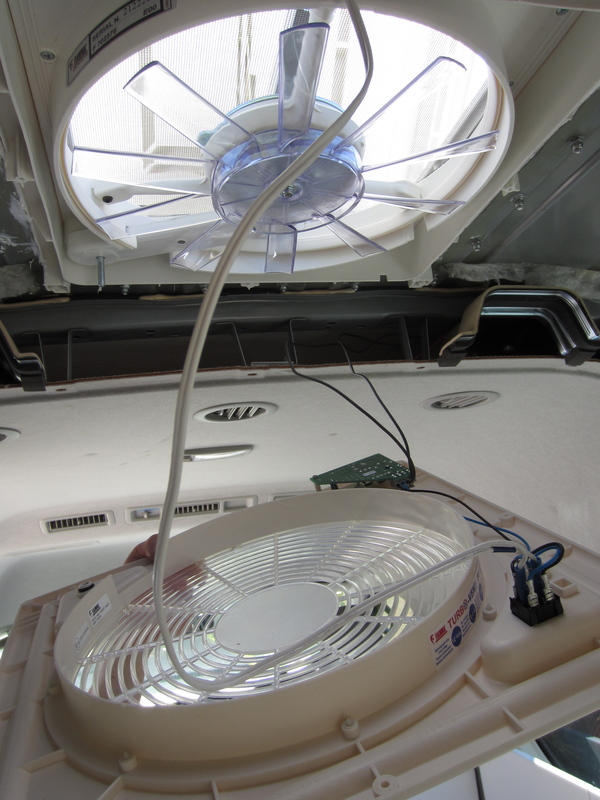 This entry was posted in Building a diy campervan, Camper ventilation and tagged building a campervan, Campervan conversion project, campervan fan, campervan insulation, campervan ventilation, campervan with pop-up roof, Converting a campervan step-by-step, DIY campervan, Fiamma Turbo Vent, how to install a ceiling fan in a campervan by Rach. Bookmark the permalink. Nearly finished and looking great, just like you hair is now Rachel!! LOL. Looking forward to you guys coming down here to try it out and show it off to the girls when they return. Oops, forgot to login as twitter; what a twit! I know – two days later and I’m still brushing white sticky stuff out. That’s what happens when you get involved with manual labour! Whew – I am glad that job is over!!! Well done crew……………..getting closer to that holiday! Yes Paul and his hole saw are also very glad it’s over! That’s the end of the major structural works, just a few interior bits to finish now, then we can hang up the Christmas decorations and be off! Paul, that hat is hilarious. Please wear it more often in my presence. I can’t believe you haven’t seen the hat Alice – you have to surgically remove it from him in summer!